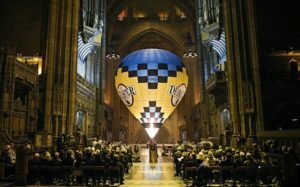 In our very late December News we reported on the trial inflation of a balloon inside Liverpool Cathedral. The inception and instigation of this wonderful happening was all due to the efforts of dear old Birdman Batchelor and here is his story of what happened come the day the event proper took place. Images courtesy Robin B and Gareth Jones. When Hamish Ogston was at prep school, he read an old motoring magazine which showed a 1921 Deemster made by the Ogston Motor Co. in London. He understandably vowed to try and find one. Many years later he succeeded, and not only did he find one, he found FIVE, although it took some years of patient detective work. In 2014 he mounted an expedition to drive the Deemsters to The Isle of Man where the magistrates are known as ‘Deemsters’. 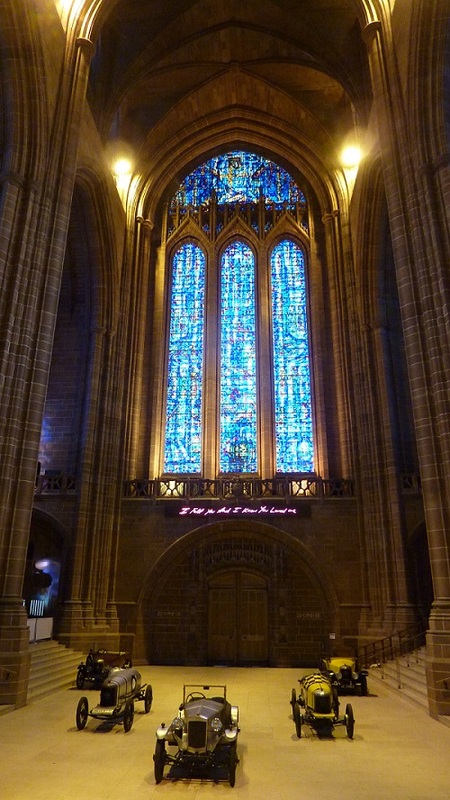 We stopped off en-route to have all five cars ‘blessed ‘ inside Liverpool Cathedral as part of Ogston’s passion for encouraging people to use the enormous spaces inside Cathedrals for events other than worship and thus raise the funds for their upkeep. 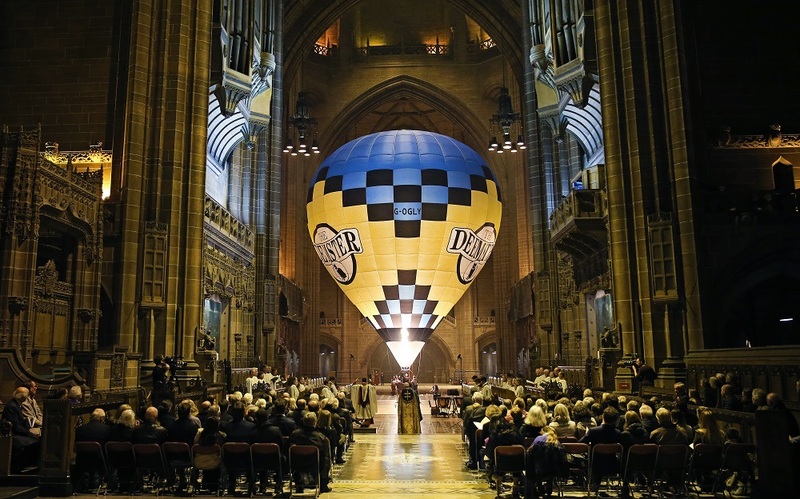 It was during that service in 2014 that I realised there was ample room to inflate the Deemster hot air balloon, G-OGLY, inside the Cathedral and the seed was sown. It took time to write the risk assessment and answer endless questions from the authorities responsible for the enormous Anglican Cathedral designed in 1902 by Giles Gilbert Scott, aged 22, who also designed the slightly smaller iconic K2 Red Telephone Box. The first trial inflation was in area known as ‘The Well’, immediately inside the Cathedral’s enormous entrance door where we had parked the five Deemster cars in 2014. The inflated balloon just brushed the stone walls at either side, but everybody was happy and we were given the green light. However, I did notice how much bigger the ‘Central Space’ directly beneath the tower was, the external pinnacle of which is 330 feet 1 inch above the level of the Cathedral floor. More phone calls and some weeks later the next trial inflation was in the Central Space which involved transporting all the balloon equipment on trollies through underground passages which lead to a lift. 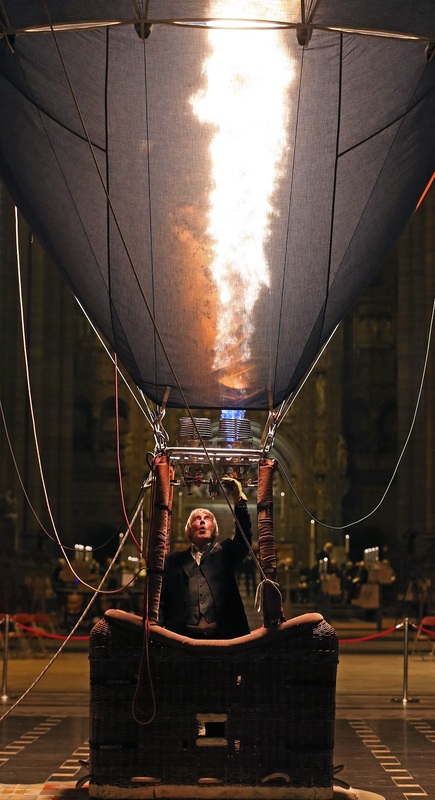 We had to maintain a respectful silence until the service ended and at 6 pm on the dot, a great oblong section of the marble floor slowly rose in front of our eyes and revealed the balloon in the lift beneath. It was difficult not to feel religious. 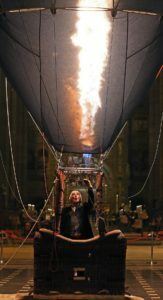 The basket was placed 5 feet beyond the centre point of the Central Space to ensure the top of the balloon missed two lights hanging down in mid air. Up she went and just stood there, good as gold. Not a breath of air of course. I could get used to this indoor ballooning. The organ is the largest in Britain and it is a breath-taking experience to listen to the sound emitting from its 9,582 speaking pipes ranging in length from 32 feet ( which produces a sound a major sixth below the lowest note on a piano ), to ¾ inch. They had the resident organist playing so they could judge how much the burner might drown the organ’s sound. No contest, the colossal sum spent on refurbishing this fabulous instrument was well spent. 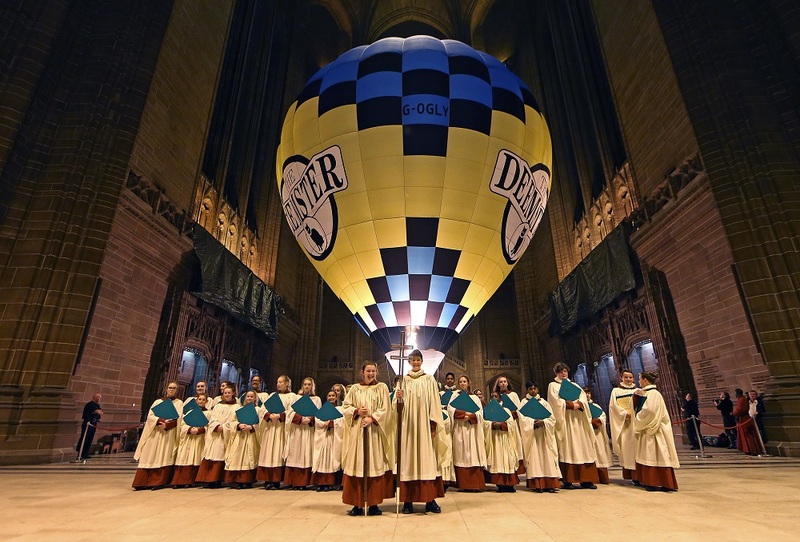 Once the balloon was inflated, 4 young probationary choristers were helped into the basket for a photo shoot and we ascended gently as they sang Silent Night. 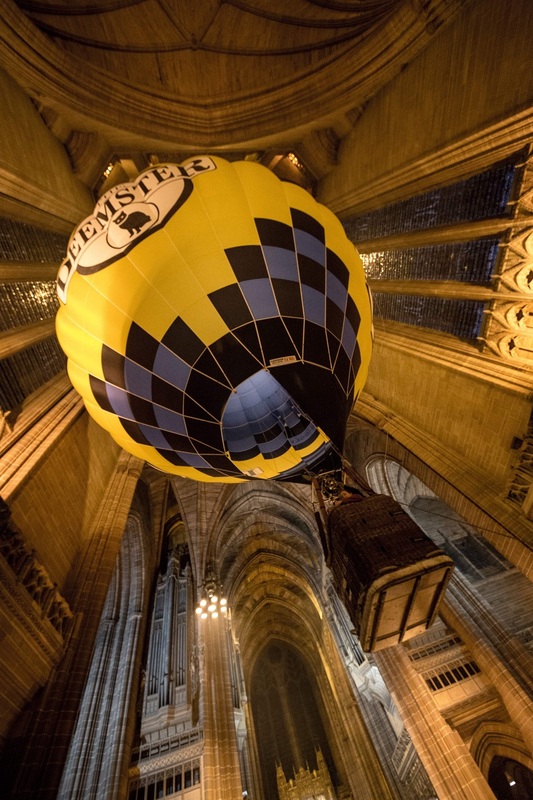 The balloon ever-so-slowly drifted towards the enormous stained glass window so me crew gently pulled me back to the middle. I did my best to coordinate the burns so I wouldn’t drown out the Dean’s holy words or the angelic voices of the choir. One piece went on a bit on long side and the flying wires slowly started to go slack as the air in the balloon cooled and the envelope started to sink. No problem though and as soon as it was over stability was quickly regained! I don’t know how high I flew but as I gained confidence I went as high as the handling line would allow, about 40 feet we reckoned. It was surreal. It was spectacular. There was nothing really to worry about, but the relief when the balloon was safely deflated on the Cathedral floor was immense. Drinks were served and I pondered over how to word the entry in my log book.